Dean was brought up in Llangybi, Dyfed, West Wales and Initially practised in Chiswick, London, W4 before moving back to Wales in 1993. 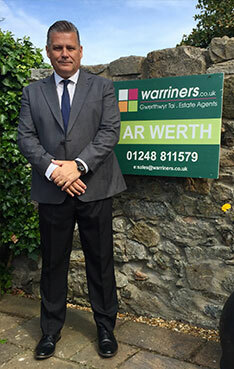 He is widely regarded as one of the most experienced estate agents in North West Wales with 33 years listing and selling properties, 24 years of those years covering Anglesey and mainland Gwynedd. “At warriners.co.uk, we are answerable to our industries leading professional bodies as a member of the Property Ombudsman Scheme and the National Association of Estate Agents, we maintain the highest of professional standards by conforming to clearly set guidelines. This ensures that our clients are protected and is a clear indication that you are dealing with a thoroughly reputable agent. We are very proud of the fact that a large proportion of our business is return business and referrals from satisfied clients who have recommended us to colleagues, friends and family. We are determined to maintain this as the core of our business moving forward into the future."